In one of my more important articles — A One Step Way to Lose Your Account � Forever — I discuss the sad reality that accounts are frequently lost because people fail to set up recovery information (or keep that recovery information current). In most cases, it's a simple oversight with disastrous results. One day, your account gets compromised somehow, and you have no way to prove you are the legitimate owner. Without that proof (in the form of recovery information used to verify your identity), your account is no longer your account. Period. Forever. Sometimes, however, there's a much more frustrating reason people fail to provide recovery information — in particular, their phone number. The reason email service providers want your phone number is very simple: when (not if) you have trouble logging into your account, that phone number can be used to verify that you are who you say you are. Your phone number is one small part of your identity. As long as you maintain that number in working order, it's how the people you share it with reach you. Even if you lose your phone, that number can be quickly reassigned to its replacement by your carrier. If an online service needs you to prove that you're the account owner and you have the right to log in to that account, even if the password doesn't seem to be working, that phone number you gave them is the proof they use.1 They text you a code. Your ability to provide that code when asked proves you have the phone at that number. It proves you are who you say you are. It proves you should be allowed access to the account to which you associated that phone number. Google will not use your mobile phone number to spy, track, or otherwise compromise your privacy. Yet, some people are absolutely convinced that if they hand over their phone number, all of a sudden Google is going to do exactly that, and probably more evil things they can't even think of. They fear Google more than they fear losing their account. It's frustrating, because many systems, such as Google's own two-factor authentication, can use non-SMS-capable phone lines to provide a code at recovery time via automated voice. Why this is not currently available for alternate account verification, I have no idea. They could also do a better job explaining their reasons for asking for a number in the first place, and how and when that number would be used. I keep saying "when, not if" you run into account access problems, because it happens to all of us, for a variety of reasons. It's just a matter of time. Without alternate access information, you stand a real chance of losing your account forever. If you have a mobile number, add it to your account. If you have an alternate email address, add it to your account. If there is additional information requested that could be used to prove your identity to recover your account, add it to your account. Some day, you'll be very, very glad you did. There's no avoiding the issue: privacy issues are scary, complex, and even somewhat mystifying. The Ask Leo! Guide to Online Privacy tackles these topics in terms you can understand. The Ask Leo! Guide to Online Privacy will help you understand what's at risk, what steps to take, and what to do when you're not sure. For one week only, the digital edition of The Ask Leo! 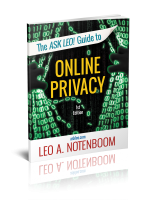 Guide to Online Privacy is 20% off! How Do I Know If My Computer Has Been Compromised? What are the signs that my PC has been compromised, if nothing is visibly noticeable? By that I mean that perhaps someone is quietly reading my e-mail, or even somehow sees my screen or logs my keystrokes? You're not going to like the answer to this one. There may be no signs at all. It's possible for a machine to be compromised even though it seems to be working properly. That's why we need help. Continue Reading: How Do I Know If My Computer Has Been Compromised? In a previous article, I showed you how to create a backup image using Windows 10's built-in backup program. Along the way, we were prompted to create what's called a "Recovery Drive" to be used in the event of a disaster from which you wish to recover. A recovery drive is a USB flash drive from which you can boot your computer in order to restore a previously created image, as well as perform a number of other Windows recovery tasks. You don't have to be taking a backup image to create a recovery drive, and it's actually convenient to have around; it can take the place of your original installation media should that not be available. « Previous post: Ask Leo! #657 – How Do I Get a Program to Auto-start When I Sign in to Windows?